the awareness of the potential traps when switching quadrants along the cycle. When things have reached their maturity, and do not grow any more, another cycle gets prepared via the renewal part. It is time to move to another thing. Together they form the Ecocycle. LEADERSHIP STYLE & GROUP CULTURE Management, risk‐ sensitive and productivity oriented. MEMBERS Few highly specialised, regularly participating members. STRUCTURE & PROCESS Hierarchical structure, standardization, institutionalized roles and procedures. ACTIVITIES & PRODUCTS Preparing, monitoring and adjusting detailed workplans. Performance measurement. These are the three other mindset . Appreciate the difference. PURPOSE To dismantle pattern of working together on non longer productive ideas to clear the way for new vision, relationships and directions to emerge To expand the number of innovative ideas for achieving the transformation in a way that improves the conditions for their successful development. To develop a pattern of working together that turns promising ideas into effective strategies . LEADERSHIP STYLE & GROUP CULTURE Charismatic, visionary and values‐based. Creative, inclusive and mission‐driven. Entrepreneurial, adaptive and outcome driven. MEMBERS Smaller number of core members, relational. Large, diverse, often unusual mix of participants, with stable core group. Smaller number & variety of members focused on particular areas of work. STRUCTURE & PROCESS Informal, loosely connected, flat, eclectic and sporadic connections. Informal, time limited, overlapping, loose task groups and teams. Multiple layers of participation Tasks, roles and relationships become explicit. Patterns emerge for process and structure. ACTIVITIES & PRODUCTS Reflective learning. Scanning of trends. Relationship building with Stakeholders. Visioning. Community conversations. Idea generation. Best practice research. Experiments. Simulations. Planning. Developmental Evaluation. Pilot projects & prototypes. Adaptive planning. Begins with formative evaluation, ends with summative evaluation. RIGIDITY The group is unable or unwilling to change or dismantle an approach that no longer fits the evolving context in which they operate. Psyche of immediate return. Fear of uncertainty. Self‐Interest. Lack of clear exit rules. Concern about perception of failure. Pressure to continue by entrenched constituency (e.g. ‘too big to fail’). [#hurst_life_1994]: Hurst, David K., and Brenda J. Zimmerman. 1994. “From Life Cycle to Ecocycle: A New Perspective on the Growth, Maturity, Destruction, and Renewal of Complex Systems.” Journal of Management Inquiry 3 (4):339–54. https://doi.org/10.1177/105649269434008. [#hurst_crisis_1995]: Hurst, David K. 1995. Crisis & Renewal: Meeting the Challenge of Organizational Change. The Management of Innovation and Change Series. Boston, Mass: Harvard Business School Press. [#phases_of_collaboration.pdf]: “Phases_of_collaboration.Pdf.” n.d. Accessed March 19, 2018. http://vibrantcanada.ca/files/phases_of_collaboration.pdf. [#lipmanowicz_liberating_]: Lipmanowicz, Keith McCandless, Henri. n.d. “Liberating Structures – 31. 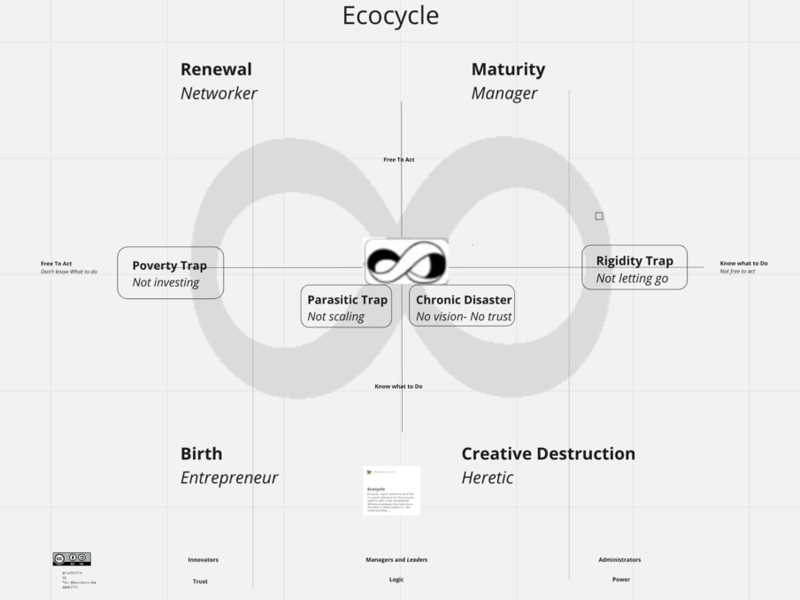 Ecocycle Planning.” Accessed May 9, 2018. http://www.liberatingstructures.com/31-ecocycle-planning/. [#hurst_new_2012]: Hurst, David. 2012. The New Ecology of Leadership: Business Mastery in a Chaotic World. New York: Columbia University Press.